A nice review of a recent heraldry book appeared recently on the Catholic News Service under the headline: "Hark, the heraldry: cracking the coat of arms code." I think that the headline may be a little bit over the top; the "code" of heraldry really isn't really all that hard to "crack," or else we would all have taken up other, easier hobbies. 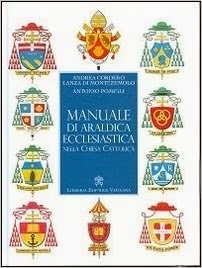 Still, it's a nice review of the Manuale di araldica ecclesiastica by Cardinal Andrea Cordero Lanza di Montezemolo and Antonio Pompli, noting that the book (written in Italian) "gives an in-depth look at the history and 'grammar' of a properly designed coat of arms." 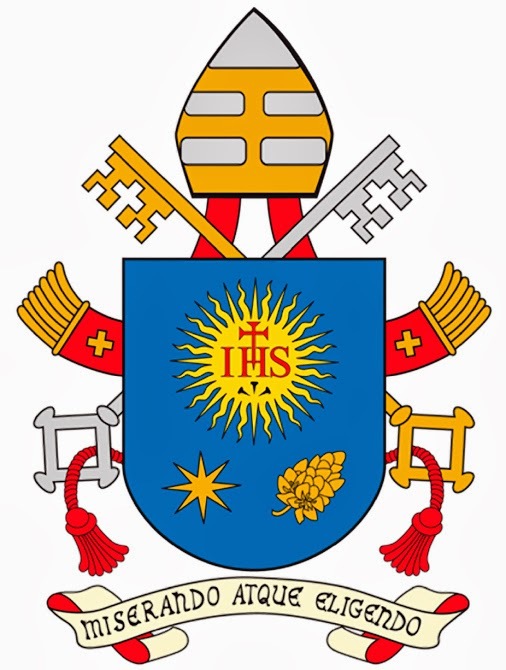 The review also includes a number of pictures from the book, including the arms which the Cardinal devised for, and his proposed revised coat of arms for the retired, Pope Benedict XVI. The full article can be found at the website of the Catholic News Service at http://cnsblog.wordpress.com/2014/02/05/hark-the-heraldry-cracking-the-coat-of-arms-code/ and is worth reading. All in all, it looks like an interesting and )fortunately for those of us who don't normally read a lot of Italian, although my Spanish will carry me through a lot it) well-illustrated volume on ecclesiastical heraldry in the Catholic Church. It won't topple Archbishop Bruno Heim's Heraldry in the Catholic Church from its premier position in this subject, but certainly looks like it would make a good companion to it. * The motto ribbon beneath the shield should remain white on top and end up red when it curls at the end.